Allow me to introduce myself. My name is Dr. Elissa Smith and I am a chiropractor. My mission is to radically impact how we care for ourselves and those in our employ. No other profession has addressed the issue of injury prevention or health and wellness with the intensity, compassion or efficacy as the chiropractic profession. Since 2003 I have spoken about the various ways chiropractors can assist business owners in the prevention of on-the-job injuries. I have personally spent countless hours working with individuals and companies to reduce injury frequency, severity and cost. I have extensive education on such topics as ergonomics (the study of people at work), kinesiology (how humans move), functional physiology (what happens inside our bodies when we put different foods in them) and life coaching. I also have several additional certifications that promote healthy living. As the burden of health care and the costs of injuries continues to rise, I have seen an increasing interest on the part of business owners to contain costs through workplace injury prevention and health promotion programs. Lets take a look at how much is really at stake. As a business owner, what does NOT having a workplace injury prevention and wellness promotion program actually cost you? With over 11 million workers, construction is one of the largest industries in the U.S. The industry has one of the highest rates of work-related injuries and suicides, and also has a high prevalence of musculoskeletal pain among its workers. A 2012 study found that 40% of construction workers over age 50 had chronic back pain. 80 percent of all claims under workers’ compensation are musculoskeletal sprain/strain injuries, with lower back injury consuming more than 33 percent of every workers’ compensation dollar. 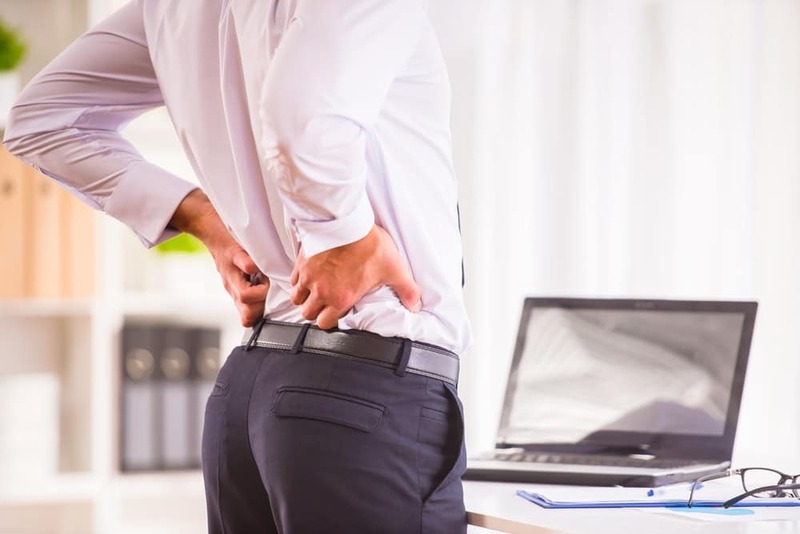 Back pain causes more than 314 million bed days and 187 million lost work days yearly (data from the U.S. Department of Labor, 1998 to 2005). Employers lose 5.9 hours of productivity per week from those suffering from musculoskeletal pain who continue to be on the job (referred to as presentee-ism). A U.S. Department of Health study showed that from 1996 to 2004, managing musculoskeletal disease cost an average $850 billion annually (including lost wages), making it the largest workers’ compensation expense. For employers paying workers’ compensation claims, the economic strain has reached a tipping point. The need to implement workplace injury prevention and health promotion education has never been greater. The wellness movement is viewed by some companies as the latest management fad, by others as an expensive bit of unnecessary fluff. Critics often view it as a cheap public relations gimmick. It should, however, be seen as a solid investment. For every dollar spent on injury prevention and health promotion, the savings to industry can range from $7 to nearly $12- thats a 700-1200% return on investment! While some larger companies have instituted wellness programs, smaller companies with fewer resources often struggle to combat rising health care costs. In the United States, 99.5% of all businesses are small businesses. Many Americans work for companies with less than 10 employees, and a full half of all employed people work for firms with less than 100 employees. While many of these companies may not have the financial resources to make elaborate changes, the bottom line is that changes need to be made. As a business owner with employees, you must find a way to get started in order to save yourself thousands in claims, sick days and lost productivity. If you are interested in learning more, and would like help implementing a health and wellness program at your company, contact us. I would love to partner with you to create your productive, healthy and injury-free workforce! "A lot of contractors are seeing the connection between safety and health on the job and realizing the benefits that wellness programs can have both for job performance and their bottom lines," says Kevin Cannon, director of safety and health services for the Associated General Contractors of America.